In October of 1921, The Charlotte Observer reported the opening of a new school building in Roanoke Rapids "as a thing of great credit to a town of 3,500 inhabitants." 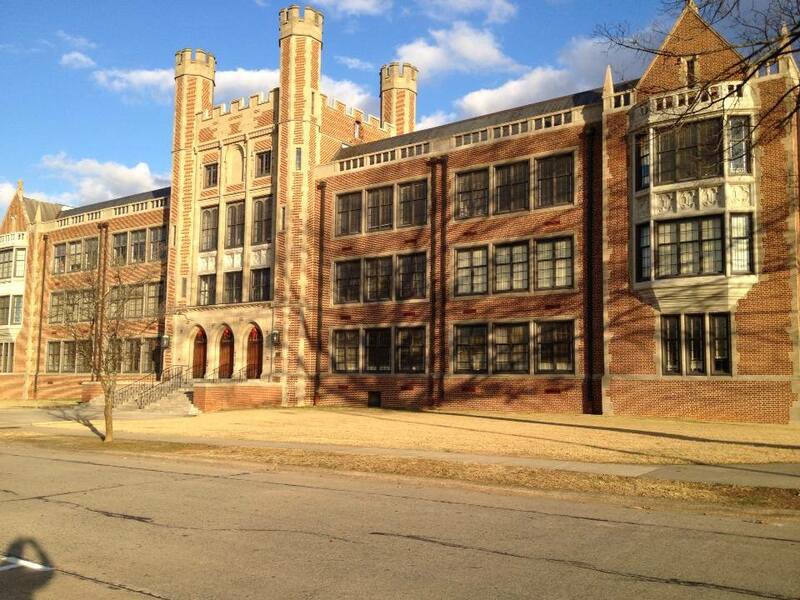 The article declared Roanoke Rapids High School to be "the largest and finest high school building in North Carolina." Designed by renowned New York architect Hobart Upjohn, and built at a cost ten times the average high school in the state, the RRHS building was central to Samuel Patterson's vision of Roanoke Rapids as a model "New South" town. It was a true article of faith, a symbolic offering to the power of education and the future of this small community. Upjohn's design for the building was a modern adaptation of the Elizabethan Gothic or Tudor Revival style, a reference to the great universities at Oxford and Cambridge. The plan is in the form of a modified "H," with three projecting bays across the front and the auditorium situated at the center of the crossing hall. This design provided for natural lighting in all classrooms and allowed community access to the auditorium and library (originally located on the second floor) without disturbing classes. 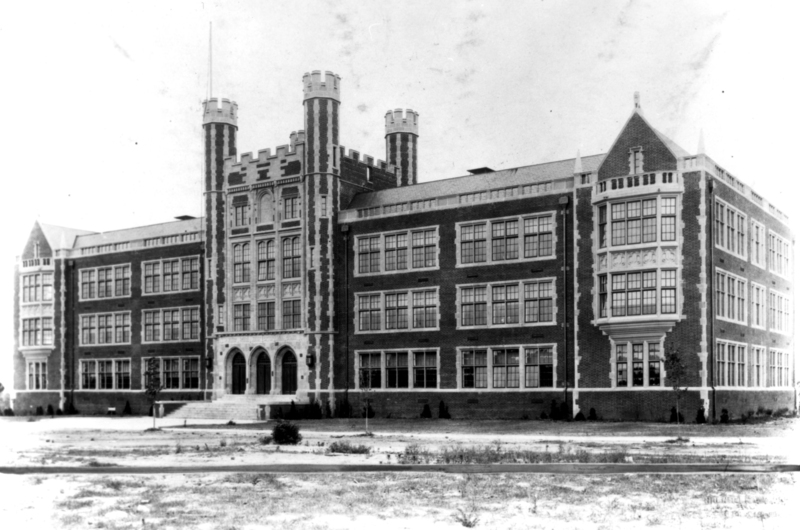 When completed the school contained twenty-four classrooms, an indoor pool, a gymnasium with an elevated track, and a two thousand seat auditorium, which was said to be the best facility of its kind between Washington, D.C., and Atlanta. Indeed, Patterson intended for the auditorium to be the town's cultural center and saw to it that the stage and fly-space could accommodate sets of Broadway theater and the Metropolitan Opera. The auditorium was dedicated in January 1922 with a showing of "The Three Musketeers" starring Douglas Fairbanks. Today the Senior High Building continues to serve as an active school, and it remains unchallenged as the architectural centerpiece of the town. In 1988 the Senior High Building was placed on the National Register of Historic Places, and recently a North Carolina preservation expert called it "the best high school building in the state." The Senior Building is part of Sam Patterson's legacy, but so too is Roanoke Rapids High School's tradition of educational excellence. The history of the school and the school district is a tribute to the progressive leadership begun by Patterson and sustained by countless others. In 1921, under the leadership of Superintendent Eugene Coltrane, Roanoke Rapids schools established the first junior-senior high school in North Carolina. The Board of Education in 1933 approved a special tax to add a ninth month to the standard eight-month school year, the first in the state to do so. In the 1940's, under the leadership of Superintendent I. E. Ready and Principal Joseph Talley, the high school became a leader in vocational education while maintaining its position as one of the top academic high schools in the state. In 1957, the high school campus expanded to add a modern physical education building. Thirty years later this facility was named the Joseph W. Talley Building in honor of the man whose distinguished service to the district included a term as superintendent that began in 1958 and ended with his death in 1978. During this time he oversaw the desegregation of the Roanoke Rapids schools and was a guiding force in the continuation of progressive education. At the high school, Principal Bill Branch provided a strong and steady influence over two generations of students. In 1979, Robert Clary succeeded Talley as superintendent. In his ten-year administration, Clary strengthened Roanoke Rapids School District's place among the most innovative in the state. Under his leadership, the district became the first in North Carolina to offer kindergarten to all five-year-olds, and in 1987 the Public School Forum of N.C. rated the school system as the number one district in the state. Clary, along with the school board, was also instrumental in establishing the Roanoke Rapids Education Foundation, a non-profit fund-raising organization designed to mobilize community resources in support of the school district. The Foundation's first major project was the renovation of the high school auditorium. A central heating and air-conditioning system was installed and insulation was added to the interior masonry walls to eliminate damaging condensation. The hardwood floors were refinished, the brass railings cleaned and polished, and the original lighting fixtures refurbished. New cushioned seats replaced the original seating on the main floor, but the rest of the old wooden seats were saved for use in the balcony. In more recent times, the high school and the school system have vigorously upheld the tradition of providing exemplary educational opportunities, facilities, and leadership. In the 1990's, during the superintendence of Mike Williams, the district won three Governor's Awards of Excellence in Education for innovative instructional programs developed by teachers and central office leaders. During Superintendent Jane Burke's administration, the Junior Building, the home economics cottages, and the vocational trades buildings were removed to make room for a state-of-the-art facility to house science, mathematics, and vocational classrooms. The facade of the new building reiterates architectural features of the Senior Building, and blends nicely. As a part of the campus redesign, the old wood shop building was gutted, expanded, and converted into a new library. To complete the new landscape, a beautiful courtyard now occupies the site of the old Junior Building, the parking lot and the driveway. Prominently located in the courtyard is a plaque in tribute to Joyce Crane, secretary to the principal and friend to students, teachers and staff at RRHS for over 50 years. The new millennium bodes well for Roanoke Rapids High School and the district, one of the last small independent school districts in North Carolina. Under superintendent Jane Burke and the current superintendent John Parker, the district has amassed over $4,000,000 in competitive grants for the development of instructional programs. In addition, the district has procured nearly a million dollars in grant funds for the repair and renovation of the RRHS Senior Building, an icon that still presides over Hamilton Street in the heart of Roanoke Rapids. It remains today an active school building, the cultural center of the community, and the architectural embodiment of educational excellence . As her colors proudly fly. Her colors streaming, glad faces beaming; So here's a cheer for her, for her we love so well. Let every heart sing, let every voice ring, There's no time to grieve or sigh. It's ever onward, her course pursuing. On the track and with the ball. May her colors never fall. Her boys the fleetest, her girls the sweetest, So here's a cheer for her, for her who'll never yield.